The newest fuel efficient on-highway truck in North America combines legendary Western Star style and reliable durability with leading Detroit fuel-efficiency and proven Daimler aerodynamic technology. LAS VEGAS – Sept. 11, 2014 – Adding the industry’s most advanced fuel saving technologies to the industry’s toughest trucks, Western Star Truck Sales, Inc., has now unveiled the all-new 5700XE. The Class 8 on-highway truck is ideal for owner-operators and small to medium fleets in truckload/LTL, bulk, refrigerated, long-haul and manufacturing applications. The 5700XE features a 126-inch BBC with a set-back axle, and is available in a range of spacious and lightweight sleeper configurations. 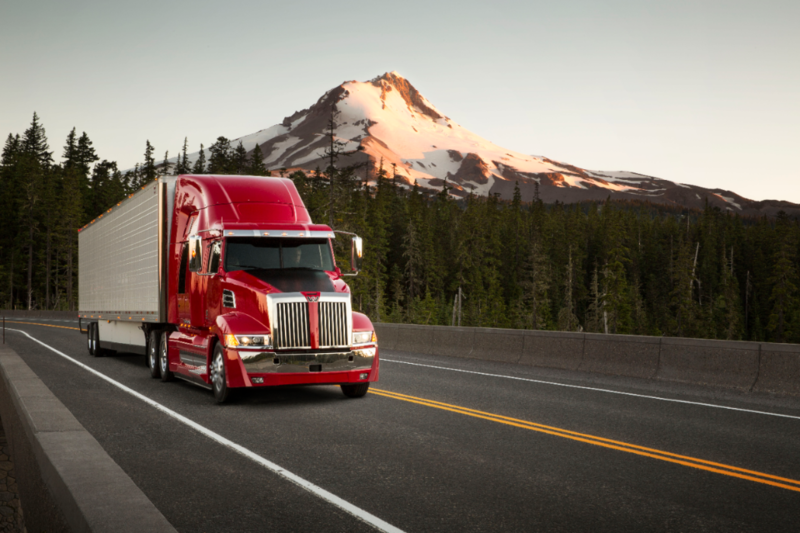 “The 5700XE builds on proven aerodynamic technologies from parent company Daimler Trucks North America and adds edgy styling to set it apart from other trucks,” said Ann Demitruk, director of marketing for Western Star. A new sweptback four-piece bumper with an under-bumper valance that contributes to aerodynamic efficiency. New halogen headlights that are optimized for aerodynamic performance and excellent visibility. A state-of-the-art visor specifically engineered to work with the impressive slope in the hood’s rear air ramp to direct airflow over the cab without an aerodynamic penalty. Roof and cab fairings that sweep back for tighter trailer gap and help direct air flow over and around the trailer. Optional chassis side fairings that reduce drag by up to 6 percent while still providing easy access to batteries and DEF tank. The Western Star Twin Force dual air intake, which feeds a massive centrally mounted air filter to improve efficiency. The 5700XE can be spec’d with the fuel-efficient Detroit™ DD15® engine. The DD15, which features the proprietary asymmetric turbocharger and next-generation ACRS fuel system, delivers improved fuel efficiency and total cost of ownership while providing the power drivers demand. The 5700XE can also be spec’d with the Detroit DD16® engine, which, with up to 600 horsepower, delivers the maximum power many Western Star customers require; or the Detroit DD13® engine for regional and weight-conscious customers. The truck comes standard with the Detroit DT12™ automated manual transmission that can be mated to any of the Detroit engines offered. This transmission helps customers reduce the total cost of operation, significantly improves the driver experience, and contributes to improved driver safety. 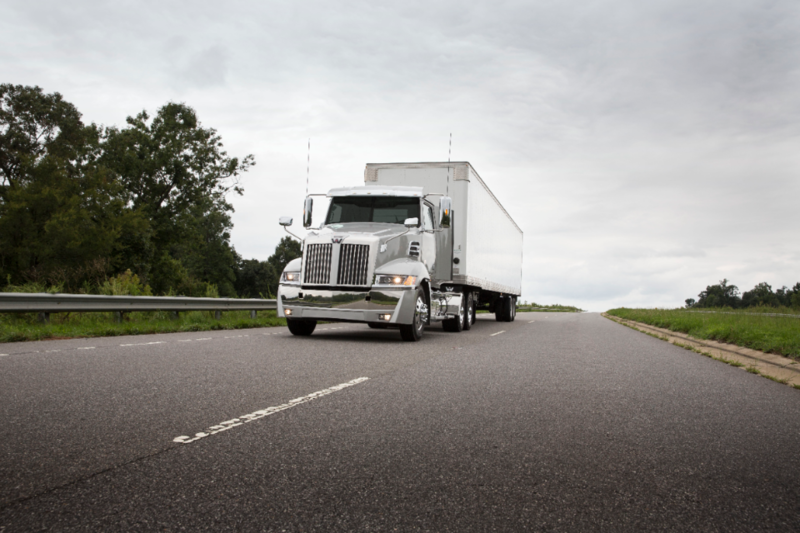 For ultimate efficiency, customers can select the new integrated Detroit Powertrain. Featuring the new downsped DD15 engine rated at 400 horsepower and 1750 foot-pound torque, DT12 transmission with Intelligent Powertrain Management and Detroit axles with specific configurations and gearing, the integrated Powertrain is engineered to work together to achieve the highest level of efficiency. The 5700XE is also equipped with the proprietary Detroit Virtual Technician™ remote diagnostic service, which is part of the Detroit Connect suite of integrated telematics solutions. Detroit Connect also includes Visibility fleet software and the forthcoming On-Board Tablet, as options for the 5700XE. Hand-built at the award-winning DTNA Cleveland (N.C.) Truck Manufacturing Plant, the 5700XE has premium style and comfort features that are built to last. Full production on the 5700XE will begin in 2015. Inside the corrosion-resistant galvannealed lightweight steel cab, drivers will appreciate the new adjustable steering column and steering wheel, featuring integrated controls that help drivers focus on the road ahead. The well-appointed and sound-resistant sleeper further contributes to the quiet and comfortable ride drivers expect from Western Star. All Western Star trucks are backed by the 24-hour Western Star Customer Assistance Center and the more than 230 dealers in North America. For additional information, and to find a local dealer, visit WesternStar.com or call 866-850-STAR (7827).